A Phase I/IIa clinical trial is currently in progress with the first transplant succesfully concluded. Parkinson’s disease affects movement as the low levels of Dopamine causing disruption in sending signals to nerve cells in the brain that controls movement. No known cure but medications can help control the symptoms. Aerobic exercise and physical therapy that focuses on balance and stretching may also be recommended. A Phase I/IIa clinical trial is currently in progress with the first human transplant succesfully concluded. Parkinson’s Disease is a degenerative disorder that affects the neuron or nerve cells in the portion of the brain that controls movement. 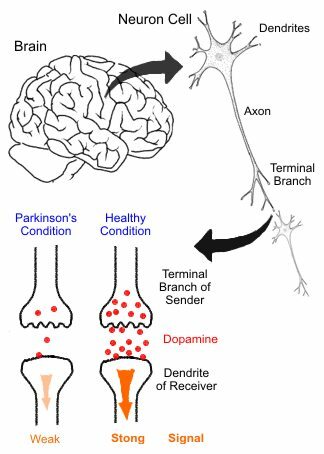 These neurons are called dopaminergic neurons as they send signals using a molecule called dopamine. It is observed that parkinson’s disease sufferers have a much lower level of dopamine, causing interrupted signals and poor motor coordination. The symptoms of Parkinson’s is physical in nature, where it may start with just a slight tremor on one hand, stiffness or slowing of movements. The symptoms progresses gradually where it may begin to affect facial expression, slurring of speech or arms that may not swing when walking and the symptoms worsens as the condition progresses over time, eventually affecting overall movement and motor skills. Parkinson’s Disease sufferers might also experience bladder problems, constipation, fatigue and pain, among others. 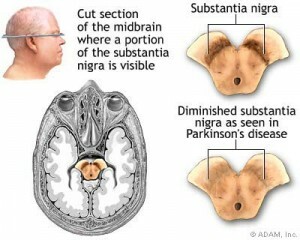 There are currently no known cure for Parkinson’s Disease and patients are treated with medication that can replace dopamine, stimulate dopamine receptors, block dopamine breakdown, or attempt to prevent the death of neurons.Some have also explored a surgical procedure called Deep Brain Stimulation where electrodes are implanted into specific part of the brain and electrical pulses is used to reduce the disease’s symptoms. Parkinson’s is a good candidate for stem cell therapy because the disease is caused by the loss of the dopamine neuron cell. The first human clinical trials is scheduled in Australia early 2016, where 12 patients would be inserted with replacement brain cells called neural precursor cells. These neural precursor cells are slightly immature neurons and are cultivated from parthenogenetic stem cells. It is believed that these neurons would complete it’s maturing in the brains hence being the neurons that the disease has destroyed. The two main research areas for treating Parkinson’s with stem cell therapy are to churn out dopamine neurons with stem cells or to insert stem cells as growth factors to protect neurons. Additional research are also focused on the best delivery method for these stem cells to the are of the affected brain. There are currently many ongoing efforts to understand how stem cell therapy is able to help people with Parkinsons. One of the main centres is the California Institute of Regenerative Medicine, where you can view the areas of research being conducted specifically to understand and treat parkinson’s disease.